I am blessed to be a part of the best high school counseling team EVER! 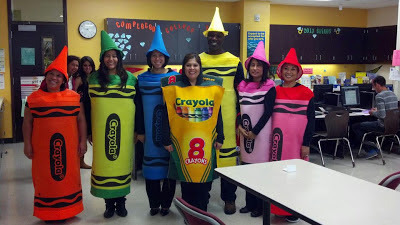 Here we are in our crayon costumes entertaining the entire school everyday with your "colorful" personalities! Another blessing is the love from our family! Here we are with some of our family members enjoying each others' company while trick or treating! The Garcia's definitely made some awesome Memories tonight! We hope everyone had a great Halloween! Every Mom Needs a Night Out! I take the role of Mommy very seriously! Rules and routines, showers and clean fingernails, chores, consequences and rewards, healthy meals, and educational activities. Sometimes it all gets too much for me! Sometimes I just want to step away from all that "mommy-ness" and just be me! When I heard of San Diego Mom's Night Out event at Kin Spa of the Hyatt Manchester of San Diego, I was super excited! I tried to rally up some of my mommy friends, but many of them were too busy being mommies to come hangout with me for a few hours! So, who do I get to come with me? My single friend, fellow "12 runs for 2012" partner, Eleina! She didn't have the "ties" of mommyhood to tie her down so she jumped at the opportunity to have free flowing drinks and unlimited appetizers with me! We also met up with my "kumare" (Filipino word for mother of my Goddaughter) Dorothy at the event who brought mommy friend, April, also! Our friends...So Cal Kids San Diego! There are lots of awesome websites out there that share the events in and around America's Finest City, San Diego. One of my favorites for awhile now is SoCal Kids San Diego! I always look forward to SoCal Kids San Diego's newsletters in my inbox to scan through the week's fun family friendly events! There are often so many to choose from! Since I plan most of our family's weekend activities, I put the events I plan for us to attend on my iPhone calendar and "share" with the hubby! If I mention it in conversation, he'll forget! But if I put it on his calendar, and it "beeps" 2 days before, and "beeps" 1 day before, and once last "beep" a few hours before, he's bound to remember! Every once in awhile hubby responds "maybe" because of work committments! Boo! I was so delighted yesterday to get an email from Red Tricycle! Jelo's Busy Bee Costume is featured on their "Street Style: Homemade Halloween Costumes From Our Readers"! When I showed Jelo that his costume and his pictures were placed on Red Tricycle, he was super excited! He said "They picked me Mom?! That's so cool!". It was neat to see the delight in his face! He was so proud and excited to know he was on "the internet" and that he was featured along so many other cool costumes. 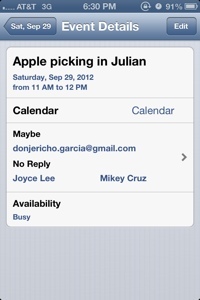 As we scrolled the costumes, Jelo's favorite (other than his own of course) as the iPhone! I was afraid he was going to ask me to make that for next Halloween! I'd like to be able to make my boys homemade made costumes from now on. Or, I should say, I'd like to make home made costumes for my boys as along as they'll wear them and still think they're "cool"! Happy Halloween everyone! Be safe and have awesome fun! Style, Pink Milk, and Aca-what?! It has been another fun filled weekend! Having a plan for a fun-filled weekend makes the work week go by faster! Saturday started with hubby doing some yard work and I doing some laundry and tidying up around the house. It feels good to do the "chores" first, then have fun. I guess it clears my conscience and reinforces my need for fun! In the afternoon, we headed to the Westfield Style Tour at Plaza Bonita in National City, CA. When I heard of this event coming to my hometown mall, I was super excited. Plaza Bonita is not in one the more "glamorous" neighborhoods in San Diego county. Yet, I was happy Plaza Bonita was hosting to allow San Diegans who don't usually visit National City a reason to check it out! I checked in at the cool set up in front of Macy's, was offered something to drink, and had a seat in some cool leather sofas while I watched a dozens of makeup artists and stylists work with other women. It is unbelievably October and I've just completed run #10 of 12 for 2012! For the history of my 12 runs for 2012 challenge, you can click here and here! For the month of October, Eleina and I took on the Southern California Rugged Maniac. When we took on this challenge for 2012, we knew we wanted to do a mud run. Rugged Maniac was the one we chose for October. When reading the description of the run on their website, the Rugged Manaic looked very challenging. It said most of the people who do this run are being who do "cross fit" and are "experienced obstacle course runners". I DO NOT do cross fit and I AM NOT an experienced runner. So, I knew from the get go this run would be very challenging. When my children were born, I started a website to document our life as a family. No more scrapbooks taking up space at home that no one would really look at! I loved how the web allowed me to share the "Garcia Memories" with all of our friends and family, near and far. Then a new months ago, I decided to transition from our family's website to a blog. I wanted to document more than the milestones of my family, but also the everyday things I do: the fun, the craziness, the things I love to do, see, and use. So, with lots of internet searches and posts from fellow bloggers, I came across Influenster. The descriptor on their website says this: "Influenster is a place for culture junkies to come together and share their unique opinions of products and experiences." Culture junkie, never heard of it, but it sure sounds like me! I came across this funny DIY outfit for crawling babies and I wanted to make it so bad! Because my boys are way beyond the crawling age, I had to figure out who to give it to. When my sis-in-law had her baby, it was the perfect time to put the outfit together! I found some mop mittens for dusting at the dollar store that I cut up. I then used a onesie and pair of pants my boys grew out of to put the mop material on. Using fabric glue, I put the mop material on the front of the onesie and the knee parts of the pants! I can't wait to see me nephew in this! 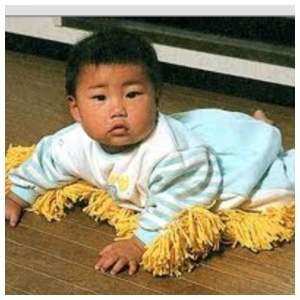 Hopefully he'll get the floors clean while he practices his crawling! You might also like... Domestic White Onesie Body Suit Glove car mop - Pack of 24 Sew No More Fabric Glue-. Thanks to my year-round schedule as a high school counselor, I have a few weeks of vacation every 6-8 weeks! Every break always goes by much faster than I would like. Tomorrow, its back to the daily grind, but today I look back on the daily diversions I've had the past two weeks! My break didn't start out 'fun' though. If you follow my tweets and blog, I shared the car accident I had the Friday of my last day at work. My kids and I were hit on our usual afternoon commute by a man who had an epileptic seizure The entire break has been communicating with insurance companies and trying to get my car fixed.